In sales (as in everything else) the right language often leads to the right reaction. Use the right words, and your prospects will begin to see the benefits of your product or service. Use the wrong words, and you’ll find it harder to close deals. That’s because the selling process always starts as a linguistic engagement before it becomes a financial transaction. Good language speeds up the transition. Bad language does the opposite. Very bad language prevents the transition from ever happening. 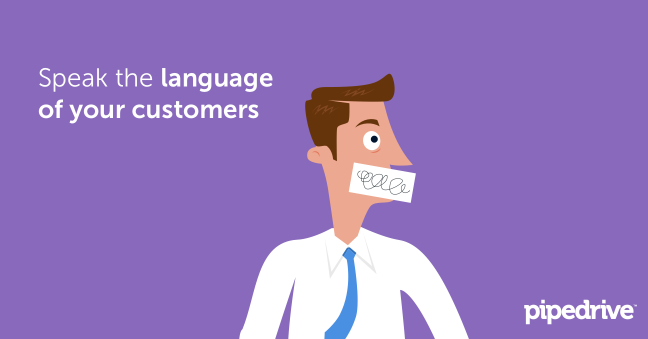 Hence, success in sales entails being aware of the verbal and nonverbal language of your customers. A big part of that is intimately knowing which words to use and which to avoid. Sounds simple, right? In most cases, it is. But things can get complicated. For example, you can start obliterating cuss words in your selling vocabulary but even that noble (and somewhat exacting) gesture misses the point. After all, who hasn’t heard of foul-mouthed personalities like Gary Vaynerchuk and "I have so many websites" Drumpf who sell their brands despite a propensity for spewing cuss words? The key, as you might expect, is context. What is the selling scenario? Which industry do you conduct business in? Who is your customer? How can your product or service solve the customer’s problem? Do your customers have a tribal mindset? Can you consider yourself part of that tribe? What’s the best language to use in building trust? Which words help tilt the customer’s purchasing behavior in your favor? Because these factors vary considerably, a bad phrase for one specific selling scenario might be something neutral or even beneficial in another. Given the shifting market realities, the best strategy you can adopt is to have 1) a default selling vocabulary on safe mode; and 2) a customer engagement process that will help you discern the optimum linguistic approach for a specific client or type of customer. Poor communication often causes negative business outcomes. That's among the key findings in a study sponsored by The Economist and Pearson English. Upgrading your business vocabulary helps minimize the negative impact of poor communication. One way to do that is to avoid using words or making statements that erode interest, motivation and trust in your brand. Trust. Establish trust by focusing on your customers and genuinely desiring to understand and solve their problems. Entering the field without doing this generates the impression that you're out only for your client's wallet.Many cliches in the sales industry emerged out of a predatory (think The Wolf of Wall Street) instead of a problem-solver mentality among sales professionals. Unless they truly describe your product, cliches like state-of-the-art technology, cutting-edge research, innovative solution, groundbreaking, robust support, seamless integration, synergy and other high-sounding terms should go. Similarly, hard-sell phrases like one-in-a-million chance, guaranteed and it's now or never should be forgotten. Mindfulness/Respect. Being customer-centric means that you should mind their needs and respect their sensibilities. Unless the engagement is in tribal mode or you are speaking with a longtime/familiar client, avoid using slang and cuss words. As previously mentioned, swearing has its purpose but doing so all the time will eventually blunt its impact and just mark you as a profane individual. Brevity. It's good to be thorough, but it's even better to respect people's time. Whenever possible, get to the point of your message as quickly as you can. Avoid filler words and phrases such as honestly, really, you know and actually. Use shorter and simpler words whenever possible. Urgency. Successful salespeople have a sense of urgency. When dealing with customers, convey the feeling that you will address their concerns within a specific and reasonable time frame. Avoid using vague terms like ASAP and I'll get back to you soon. The attention span of customers have been shrinking over the years. If you can't deliver what they want now/immediately, manage their expectations by setting a specific date or time. Optimism. Nothing saps customer enthusiasm more than a heavy dose of negativity. While there are cases when it’s important to say NO, projecting a positive outlook makes your product look good. Think twice before saying, we can't do that or that is not important. If you must, provide a creative but factual rationale why your product or service skimps on the features a customer is looking for. Focus. Knowing the product is good, but knowing the customer is even better. Remember this mantra and you'll thrive in sales. Use the word you at strategic points during the client engagement; never forget to say thank you whenever warranted; and – without patronizing – mention your customers' names to convey their importance and value. While the language of selling may vary across industries and markets, effective sales communication largely depends on a single factor: your customer. Get to know your customers intimately – how they talk, what their key concerns are – and you’re a step closer to making them consider your brand a viable solution to their problems. Use the keywords and phrases your customers are using to establish a genuine connection between your brand and their buying decision. Customer preferences and sensibilities change over time, and so should your product and the language you use in selling it.